Great game fair in Florence, Italy. 16.500 estimated visits - not a sure number since entrance is free. 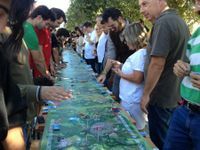 Boardgames, wargames, children games, whataver makes you play and have fun. I went with my family and everybody appreciated. Here a few of the things I saw. If you were there, please add more. Marco Valtriani was there, at the Red Glove booth, with the prototype of his Super Fantasy. A funny approach to dungeon crawling, with a lot of chrome and beautiful artwork. It seems fun already exploring characters and setting. Met Luca Bellini and Mario Sacchi at breakfast in the hotel. 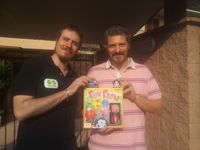 They are designer and publisher of Fun Farm, easy and lively boardgame with very nice toy animals. The look is great. I wish it all the success they deserves! Met Nazario Renzoni and Andrea Ricci of the "Accademia de’ Germini". Germini is a Renaissance form of Tarots played in Florence five/six centuries ago, also called minchiate. They are researching them, proposing again the ancient rules, organizing tournaments and game sessions. A very interesting project. 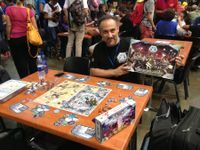 Among the people takimng part to the game there were Simone Romano and Nunzio Surace, who brought a silver and a golden out-of-commece plane won in past Wings of War tournaments. They are the designers of Galaxy Defenders, a new boardgame that had success on Kickstarter and is now coming by Ares Games. Cubing Italy built the logo of the fair with 1400 Rubik's cubes.